On the morning of May 11, 2018 local time, accompanied by Prime Minister Shinzo Abe of Japan, Premier Li Keqiang visited and inspected a Toyota Motor’s plant in Tomakomai, Hokkaido. Hokkaido sees genial sunshine and blooming late sakura in spring. When Li Keqiang arrived, hundreds of employees of Toyota Motor lined up to show their welcome, waving the national flags of China and Japan. Shinzo Abe and President of Toyota Motor Corporation Akio Toyoda as well as others greeted him at the drop-off point. Entering the exhibition hall, Akio Toyoda first briefed the leaders of both countries on the overall situation of Toyota Motor, telling the profound origin of the Toyoda family with China and its sincere desire to be committed to friendly cooperation with China for a long time. As one of the ten largest automobile companies in the world and the largest automobile company in Japan, Toyota Motor has set up more than 20 sole proprietorships and joint ventures in China, with a total of more than 40 thousand employees. China has become the world’s third largest market for Toyota Motor. Accompanied by Shinzo Abe, Li Keqiang visited successively Toyota’s new high-tech products such as multi-functional travel platform products, hydrogen fuel cell vehicles and self-driving cars. When learning that the multi-functional travel platform products promote and carry forward the concept of shared vehicles and combine multiple functions such as transportation, commodity retail, cargo transport and medical services, Li Keqiang said that this new design concept is not only convenient for individuals, but also helps to solve problems such as traffic congestion and environmental pollution, which will achieve sound social benefits. 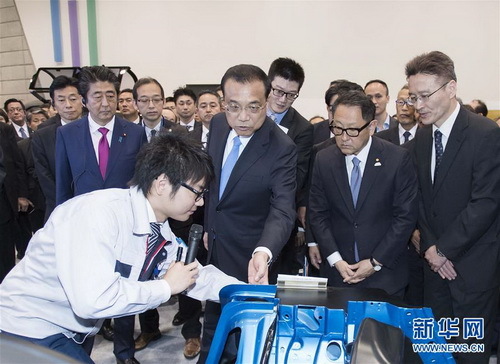 At the self-driving car exhibition area, Li Keqiang asked whether the relevant Japanese laws and policies had been adjusted for self-driving technology. Shinzo Abe told Li Keqiang that Japan will choose highways with relatively simple road conditions for tests and that related experiments have been carried out. The whole visit proceeded with continuous questions and answers between Li Keqiang and the guide interpreters, involving many aspects, such as research and development concept, design details, power mode, material supply and safety performance. Many questions are the difficulties and bottlenecks faced in product research and development. When learning about that Toyota Motor has developed research and development cooperation with China’s relevant universities in some advanced areas, Li Keqiang fully affirmed it and hoped that both China and Japan will further deepen joint research and development and innovation cooperation to create competitive new high-tech products that are suitable for markets of the two countries and third-party market. Li Keqiang pointed out that China is strengthening its building of innovation system at present. During my visit to Japan this time, I have reached consensus on strengthening cooperation and dialogue in innovation between the two countries with the Japanese side. It is hoped that the Japanese enterprises, including Toyota Motor, will seize the opportunity to further deepen their cooperation with China, so as to realize the upgrade from “manufacturing” to “intelligent manufacturing” and achieve a higher level of mutual benefit and win-win results. 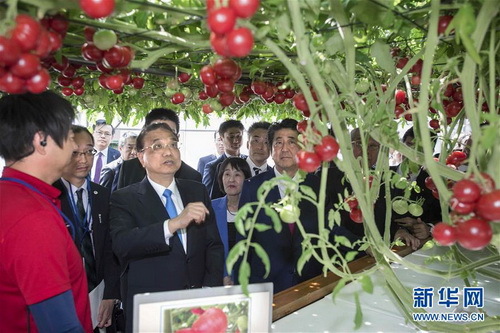 At noon, accompanied by Shinzo Abe, Li Keqiang visited modern ecological farm in Eniwa of Hokkaido to inspect the development of local modern agriculture. Wang Yi and He Lifeng attended the related activities.